Magna Latch products are well known worldwide for their specialty security products designed for swimming pool gates and fences. We have talked about Magna Latch products by D&D Technologies before. This new design continues the products world leading design and construction while improving demanded visibility. 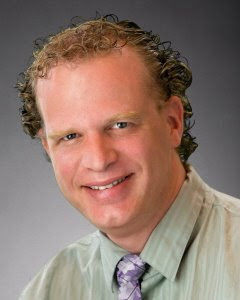 D&D Technologies consulted the market, asking what their customers wanted. In the greater majority of responses, instant visible knowledge of whether the gate is locked or not, is the most desired option. This Australian designed and built product has served swimming pool owners worldwide for over 20 years. The locking system has also been updated to allow for key cylinders that can be swapped with other brands of keyways, like Schlage, Yale etc. This means that high security key control systems can be added to pool gates, simply and cost effectively. The Fabulous Hooply Manufacting facilities located in China, uses state of the art technology and practices to create their sensational line of high-security lock products and door hardware. As shown in the video, the product line is exceptionally well made and offers one of the widest varieties of style and security available in todays market. We are pleased to become known as a representative of this sensational product line in the USA. Unlike other stateside companies, who choose to offshore their manufacturing in attempt to save costs, Hooply have always designed and built their products in China, but tailored them for the worlds market. We have mentioned some of their products already in this blog and intend to write more individual articles about different pieces in their range. Stay tuned! 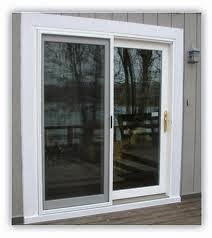 We typically receive a large quantity of requests to repair sliding patio doors for many customers. Many of these requests come from the popular Home Advisor network. Just yesterday in fact, we attended to repair a 30 year old door in use at a customers home, where the front wheel was missing completely. There were no remnants of a disintegrated wheel anywhere inside the track, underneath the door and I cannot explain how the door was working all these years. Getting the door off the track easily is/was very difficult and we were on a limited time schedule due to the customer requiring to pick their kids up from school. Thinking outside the box (which we have to do quite often), enabled us to devise a simple and quick repair that, while not a perfect solution, holds the door higher at the front of the track and allows it to ride smoothly and the door can now be locked and operated much more easily, until the customer purchases a complete new door. The solution we came up with was to install a small right angle bracket to the bottom of the frame, with the angle resting under the door. We lubricated the track with Teflon based lubricant thoroughly and the door now slides easily and lines up nicely to be able to lock. Our fabulous keyed pocket door lock is especially designed for 1-3/8" thick doors. We are in the final stage of production of an expansion kit that will allow you to use this fabulous lock on 1-3/4" thick doors. You can now even get cylinders that will allow you to re-key to Schlage (or almost any key-way) 6 pin tumbler key-ways. We were the only dealer in the USA until recently, but we are the only dealer with the modification package allowing installation up to 1-7/8" thick doors without the difficult modifications offered by other dealers. 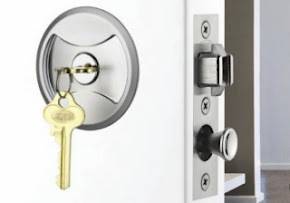 The modification kit will be able to be purchased in almost any brand key-way, so you will be able to use Schlage, Yale, Kwikset, Sargent or just about any restricted key or high-security key control systems like Bilock, Primus, Abloy etc. We are the exclusive manufacturer of this modification kit. It is not quite ready for public release but we expect to make it available in about 2 months. To maintain our exclusivity on this modification kit, we will not be tabling our technique for using this fabulous product on thicker doors, much to the angst of our wannabe competitors. EDIT 2/22/14: Lockwood just informed us of a price rise of 15% for the product, effective immediately. This may have to be carried over to our next inventory orders. If you want this product, now is the time to order it prior to the expected price increase. 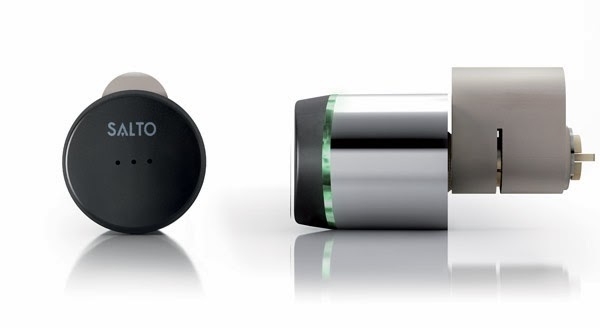 Clay are proudly introducing a Salto inspired access control solution across Europe, the UK and Australia. This intelligent access control solution will work with just about any type of mortise or rim lock, narrow style frames and padlocks. The intelligence of the Salto systems is being heralded across the world as the new frontier in keyless access control solutions. We say keyless, although you still need to carry a fob, if you are an authorized entrant. Remote control from any platform, be it Android, Apple iOS, Windows, Linux etc allows for cross platform operation that minimizes inconvenience, allows you to use an app to control your systems so that you can still let in your technician or plumber or anyone you choose, without actually being at the location yourself. There is a fabulous video on the company's site that I encourage all to view, to better understand how it works. Visit the website in the source below. Salto, have been mentioned in this blog before and are slowly becoming a major player in the hotel arena and other industries intent on maximizing control of their locking hardware systems. 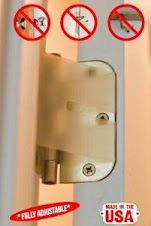 The intelligence is in the handle not the lock and because of this, there are many options available to the customer. We recently wrote an article about the fabulous Meroni UFO+ super secure lock system designed in consultation with Shipping companies and fleet managers and auto manufacturing engineers. We have been inundated with inquiries and people are lining up to pre-order the product. Above find an installation video that shows the correct procedure for fitting the product. The UFO+ comes with a unique key cylinder that is copy resistant and virtually pick proof. Keys can be registered with the factory (us) for future origination. 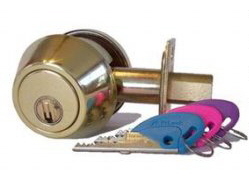 Locks can be keyed alike, master keyed or keyed to differ. Fleet managers can use their master key to access multiple separate vehicles as needs require. There are few quality options available that secure Sprinter trucks and the UFO+ is quickly becoming the sought after solution for companies and owners wishing to protect their valuable tools and equipment on board. We still anticipate releasing them commercially in the USA this summer. Stay Tuned! The number of reports in recent weeks about cruise ship passengers falling prey to onboard diseases is being seen to have sharply increased. Without any specific reasons being discovered, authorities continue to seek methods to prevent the spread of disease. Serrature Meroni manufacture anti-bacterial door hardware that helps to minimze the spread of infectious disease. The fabulous Meroni Combina and Meroni Pigio range of door handles are being sought as a possible solution to minimize the spread of these virus'. The unique attributes of the anti-bacterial handles, continue to impress authorities. The handle ranges are nouveau in design, naturally simple to operate, functional and ambient. The range of handles can allow for discerning owners to still enjoy elegant looking functional hardware while protecting the lives and interests of crew and passengers. Simple to install and retro-fit in place of many commonly used products today, both Combina and Pigio are considered a valuable asset that directly protects the lives of passengers, crew, patients and anyone that might touch the handle. Bicycle enthusiasts continue to push the boundaries of security with novel concepts that minimize weight and offer ambience combined with natural security functions. 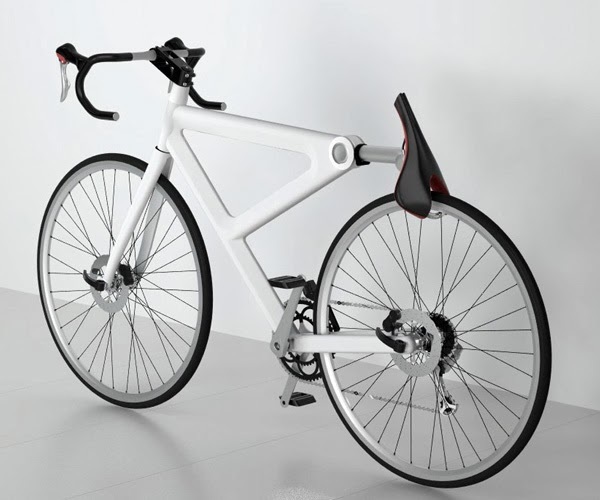 The Saddle Lock pictured here is a 2012 Red Dot Design Award winner. The unique design concept minimizes weight by combining the seat saddle with a cantilever type ratchet that allows the seat to fold back. The pocket at the saddle rear is shaped to the size of the rear bicycle wheel and it neatly fits over the wheel. The combination mechanism built into the saddle allows the lock mechanism to secure through the wheel spokes. Unlike chaining your bike to a post or fence, which often requires a third party product, that you usually need to carry or attach to your frame, the saddle lock is a built in product. Although you leave your bike without attaching it to a rack, fence or post, no one can easily ride your pride and joy away.